Project name. This will help you easily identify the project in the list. Start date. Just choose when your project is about to start or when it has started (if you are adding a project that's already running). Billable setting. 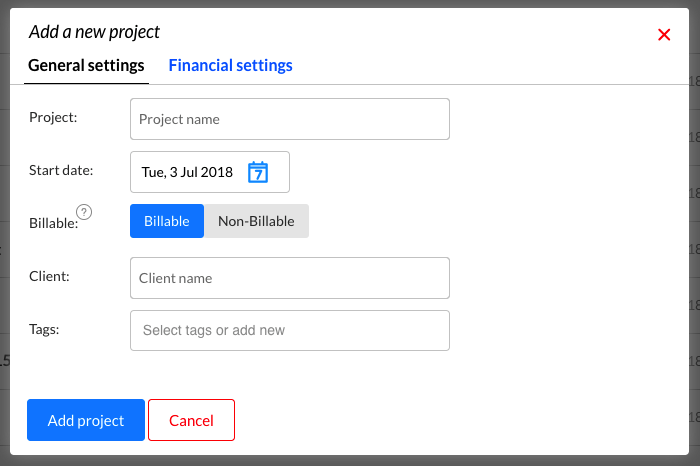 Choose if the project you are adding is internal (non-billable) or if it's going to be billed to the client. Client name. Defining a client will allow you to group and sort project in the list by client name. In addition, you will be able to define client-specific rates in the Resource section. Tags. Define tags to later ground or filter projects by in your dashboard and reports. Billing type. Set your agreed contract type for the project. Once you've finished with defining the properties click "Add project". 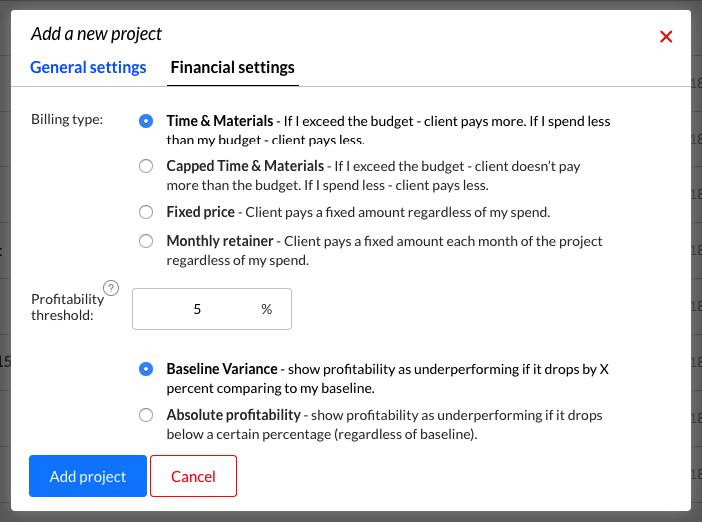 Learn more about adding defining Profitability thresholds for your projects. People - work that’s done by people and quantified in either man-days or hours. Materials - all the materials you are planning to use on the project. These will be quantified in number of units. Other Costs - all other costs you anticipate on the project. These will be items that are hard to quantify, e.g “Travel expenses”. Learn more about adding People to you projects. Adding Materials to your project is similar to adding People. However, Materials are priced per item and you will be entering the total quantity, rather than effort. Learn more about adding Materials to you projects. Adding Other Costs allows you to add Total internal Cost for line items and set if they are Billable to the client. Learn more about adding Other Costs to you projects. Once all your People, Materials and Other Costs are added to the project, you will get the full overview of your planned project Budget, Internal Cost and Profit. Now, that you have a first estimate out of the way, it's time to experiment with different versions to arrive at the final estimate so you can start tracking the project.